Fondriest Bici, the Italian designer and builder of high-end road racing bicycles, returns to the United States with exclusive distributor, Velo Europa Imports. Commemorating Maurizio Fondriest's 20th Anniversary World Championship win, the new generation Fondriest is the flagship brand held by Italy's Cicli Esperia company, one of the continent's top 5 bicycle manufacturers. Making an exciting return to the US market the all-new Fondriest offers an innovative line-up championed by the freshly-minted TF1 and TF2 framesets. Hand-built in Italy, the TF1 will be ridden in this year's Giro d'Italia by the promising NGC-OTC team of young racers. 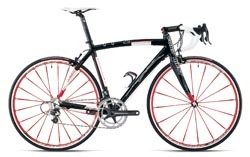 Velo Europa Imports specializes in high-end quality European cycling products. Located in Haverford, Pennsylvania, Velo Europa will provide distribution, marketing, and service support for the Fondriest line across the United States.